Sallie Wolf is an observer; she uses her training in anthropology to observe the world around her. She uses her artist’s eye to translate her observations into paintings, installations, books, music, and workshops that make sense of the data. The Moon Project grew directly out of a few casual notations in her journals which developed into an artist’s obsession. She also writes books, relying on her curiosity to guide her. 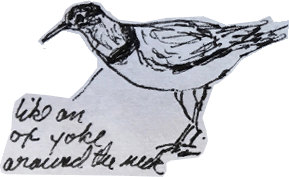 Her most recent book, The Robin Makes a Laughing Sound: A Birder’s Observations, re-released by Imagine!, an imprint of Charlesbridge Publishing, is a collection of bird observations told in poetry, lists, questions, notes, and sketches. Sallie Lives in Oak Park, IL, where her garden is devoted to attracting birds. She works out of Calypso Moon Studio in the Oak Park Arts District. She spends part of every summer in Center Sandwich, New Hampshire, hiking, swimming, sketching, and enjoying her extended family. Her resulting artwork is represented locally by Patricia Ladd Carega Gallery in Center Sandwich. Sallie and her husband, Chuck, a retired lawyer, are determined to travel the world as quickly and thoroughly as possible, while Sallie documents each trip in her journals. My art is based on the tradition of the Renaissance, when there was little distinction between art and science—drawing was the way to explore the world and to convey information. 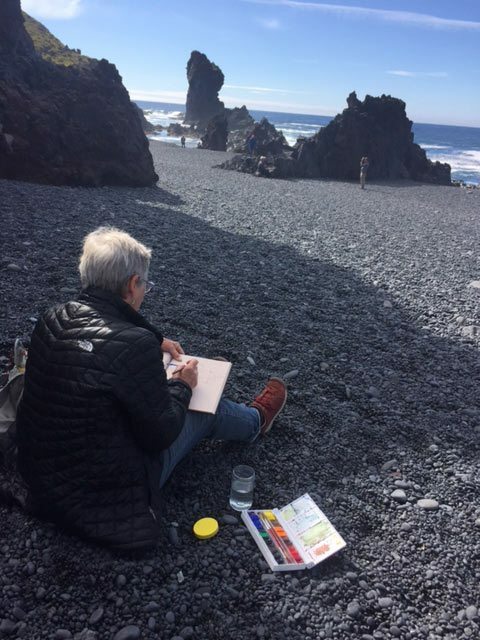 Grounded in direct observation, especially of the natural world, my art is pieced together from smaller units, much the way a journal is pieced together over time. From daily moon observations and lists of birds seen, to charts and graphs based on the information contained in those daily observations; from observational watercolor and pen and ink sketches, to larger, more abstract works based on those sketches; from the found objects I pick up on my errands and walks, to the collages made with these objects, my art reflects my observations of the world around me.